Gaurav Solanki became India's first male boxer to clinch gold in Commonwealth Games on Saturday. 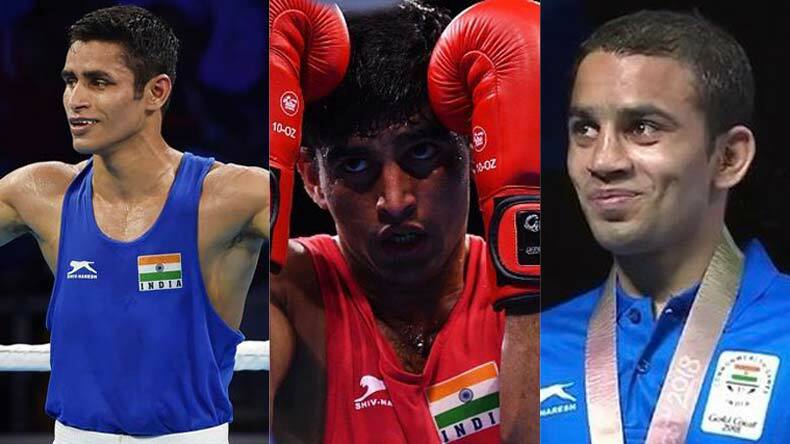 While Solanki claimed gold in men's 52kg class, fellow boxers Amit Phangal and Manish Kaushik won silver on Day 10 of the ongoing Commonwealth Games in Australia. Solanki, who made his CWG debut as a rookie along with Amit Phangal and Manish Kaushik turned out as the next big thing at Gold Coast. One of India’s most promising talents in the world of boxing, Gaurav Solanki became India’s first male boxer to clinch gold in Commonwealth Games on Saturday. The 21-year old boxer dominated his 52kg class throughout the competition and clinched a much-deserved gold in the final on Day 10 of CWG at Gold Coast. Gaurav, who hails from Ballabgarh near Faridabad bagged a 4-1 decision against Brendan Irvine of Northern Ireland. In his first appearances as a senior level for India, the rookie from Haryana turned out as the next big thing at Gold Coast. Before Solanki registered India’s first gold in CWG at Gold Coast, his compatriot Amit Phangal won silver in men’s flyweight category. Phangal and boxing icon MC Mary Kom opened India’s medal account for Day 10 with silver and gold medal finishes. Phangal came close in wining gold in men’s flyweight category as the Indian boxer lost to Galal Yafai of England 28-29, 27-30, 29-28, 28-28, 28-29. Phangal’s silver feat was repeated by Manish Kaushik who just like his boxing contingent counterpart narrowly missed out gold medal finish. The 22-year old was beaten by Harry Garside of Australia. Manish received the backing fro the judges of Wales and Canada but judges from Poland, Algeria and Ireland turned the final tie in Garside’s way. India’s first medallist in men’s category — Solanki outshined Brendan Irvine in an enchanting encounter to win India’s 2nd medal in boxing at that time. Solanki is also India’s second boxer to achieve this feat in the flyweight category (52kg) after Suranjoy Singh in 2010.